In the 19th Century, Glasgow was one of the world’s biggest industrial cities. It produced everything from sewing machines to railway carriages, but was primarily known for making ships. Much of this industrial activity was situated on the banks of the River Clyde, which runs through the heart of the city. The long process of industrial decline during the 20th Century meant that this land became abandoned as the shipyards closed. The surrounding neighbourhoods went into severe decline when hundreds of thousands of manual jobs disappeared. While this story of deindustrialisation may be common in many cities, it was the scale and severity of this decline that sets Glasgow apart from other cities. Glasgow reached its nadir in the 1970s when unemployment was high, there was little investment and the city became known as one of the unhealthiest in Europe. The 1980s saw the beginning of a renaissance of sorts, spurred by aggressive city marketing and investment in the city centre. The riverfront would see a transformation here too, including a number of large flagship developments such as the Scottish Exhibition and Convention Centre (SECC), the 1988 Garden Festival, and some new housing. In the first decade of the 21st Century, the waterfront would see new projects come to fruition, including Glasgow Harbour, two new museums and the International Financial Services District. But while there have been some successful transformations from an industrial to a post-industrial landscape, there is still much work to be done. 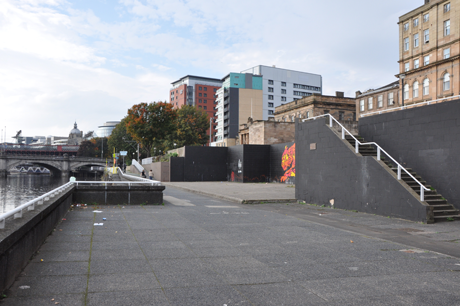 There are three main challenges which Glasgow’s waterfront faces. The biggest has to do with the scale of this transition; miles of waterfront still remain vacant because the housing, services and leisure activities have yet to be developed on a scale to replace the industrial activity which used to occupy the space. The result is that there are still many large brownfield sites waiting to be redeveloped; you can look across the river from the new Museum of Transport and stare at dilapidated piers and weeds growing along the quays. The result is a patchwork of developments that, at least on the surface, does not appear to follow a logical pattern; in some cases parts of the same project are separated by brownfields (see fig. 1). This patchwork of development is related to the second major challenge: linking up the various developments to form a cohesive waterfront. Because there have been few concrete plans for the entire Clyde waterfront, each development serves as a standalone project. In many cases, they work rather well as individual places; the new Transport Museum has proven very popular and the various housing developments and entertainment facilities are holding their own. 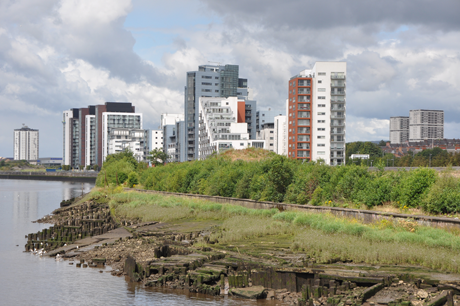 Each development tends to be single-use: housing, leisure and offices facilities are built in separate developments along different parts of the Clyde. On the south side in particular, there are very few physical links between each development, thereby necessitating detours which take you far away from the river. In a few cases, there are even housing developments which have been built right up to the water’s edge, thereby serving to ‘privatise’ sections of the quayside for the residents living there. Walking or cycling along the riverside is by no means a unified or simplistic affair. This leads into the third challenge: the quality of the built environment and the public space. Part of the inaccessibility is exacerbated by railway lines and motorways which effectively serve as a barrier between the city and the river and also increase noise and pollution which decreases the quality of the built environment. Compared to other cities, there is actually very little public space. And much of what exists isn’t very inviting (compare this to my evaluation of Frankfurt’s waterfront). In Glasgow some public space appears to be an afterthought and there is very little provision for grass and places to relax. Even in the heart of the city centre, it still remains a challenge to draw shoppers down the few hundred metres from the stores to the water. Part of this is because if they were to venture there, they would find public space that is not very appealing and does not feel very safe (see fig. 2). The newly developed quaysides near the new ‘Squiggly Bridge’ (linking the offices at the Broomielaw to the yet-to-be-developed Tradeston area) represent a more open and welcoming design (see fig. 3). But getting here from the centre requires passing under a dark and low-hanging bridge, or crossing busy streets. This doesn’t mean there isn’t demand for good quality public space along the waterfront; on warm sunny days, people do seek out the few patches of grass which exist and take the time to enjoy being by the river. All of these problems really boil down to two issues. The first is that each development is built by private enterprises, which are primarily concerned with creating profitable spaces, rather than city-building. Linking up the different parts of the waterfront together, or providing better links to the low-income neighbourhoods surrounding them are less of a priority and therefore receive little attention. The second is the scale of the transition from a working riverfront to a post-industrial one based on services, leisure, tourism and housing. Glasgow’s growth was based on industry; now that this industry has largely disappeared, the city is still trying to find ways of replacing the jobs and investment that disappeared with it. Finance, tourism, leisure and services have replaced some of this, but the city still feels too big for its present needs (a bit like someone who has lost a lot of weight but not yet bought new, smaller clothes). This is reflected in the waterfront: there simply aren’t enough luxury flats, museums, offices and restaurants to fill the entire length of the Clyde. Maybe this will happen over time. The riverfront has some attractive qualities, and Glasgow, like other cities, is slowly ‘rediscovering’ the pleasures, and benefits of having a good waterfront. But at present, the Clyde remains a patchwork of one off, mono-use developments with little connection between them. And in today’s economic climate, the idea of being able to stroll seamlessly along the entire length of the Clyde seems a long way away. Figure 3. 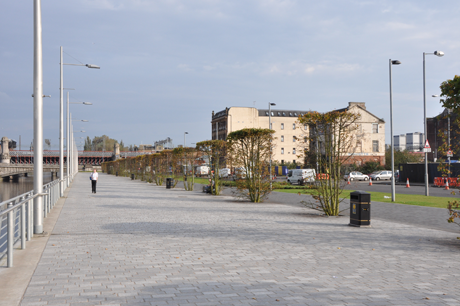 New waterfront spaces in Tradeston. It is more open an accessible, but there still isn’t much grass and space to relax.